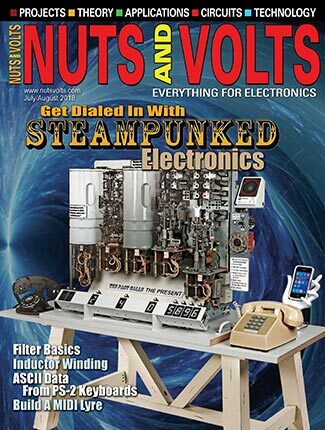 If you’ve been reading this series from the beginning, then you’ve already read a lot about the history of vacuum tubes. You might think that history is all there is to say about tubes, but it’s not so. Hard as it may be to believe, there are still some applications today where a vacuum tube is a better choice than a transistor, and even a few applications where transistors simply aren’t an option and a tube is the only choice available. High frequencies at high power levels — the higher the better — are still the domain of vacuum tubes and, if you’re an engineer working at a radio or TV station, odds are that there will be a really big tube in your transmitter. Although they’re conceptually no different from any other vacuum tube that you’ve read about, the scale of some of these broadcast tubes is amazing. Eimac Corporation, in Palo Alto CA, manufactures broadcast transmitter tubes up to half a million watts. Photo 1 shows the Eimac 4CM500,000G. PHOTO 1. 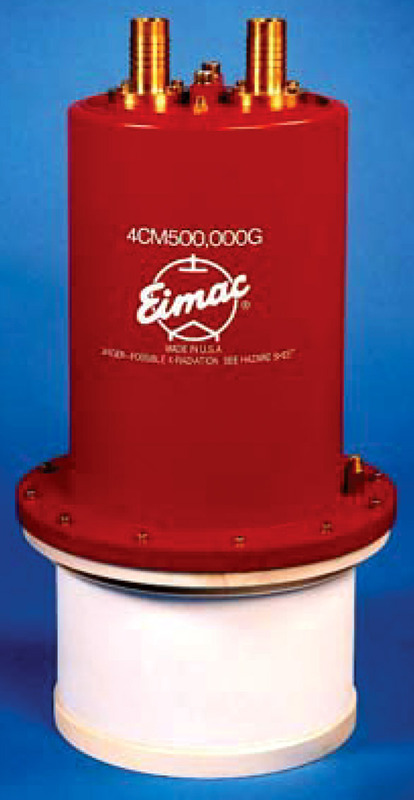 Eimac 500 kW MW/SW Broadcast Tube. This tube is really nothing more than a basic power tetrode, but one with a rated plate dissipation of 500 kW! This tube also stands over two feet tall, is a foot in diameter, and weighs about 150 lbs. The filament of this tube alone requires 23V at 500A — that’s almost 12 kW, or enough to power an average house. The 4CM500,000G is only usable for medium wave and shortwave frequencies, but tubes rule at the other end of the RF spectrum, too. UHF television transmitters commonly use an Inductive Output Tube, or IOT, in the final amplifier. The IOT is a modern variation of the classic Klystron tube, originally invented by the Varian brothers in the 1930s, and is useful up to about 1,000 MHz at power levels of 75 kW or more. Traveling Wave Tubes, or TWTs, are microwave oscillator and amplifier tubes that are used in satellite uplink Earth stations up to 30 GHz and several kilowatts of RF output. And, until very recently, a TWT was the only way to go for the downlink transmitter that’s actually carried aboard the satellite itself. Believe it or not, there are many vacuum tubes orbiting the Earth now in the form of the TWTs in the downlink transmitters on board those satellites! And finally, Crossed Field Amplifier tubes, or CFAs, are another specialized microwave tube. Similar to the familiar Magnetron, CFAs are very efficient and are generally used in radar transmitters. Since radar is a pulsed, short duty cycle application (i.e., transmit for a few microseconds, then listen for a relatively long time), large CFA tubes are able to generate pulsed outputs of many megawatts. The business end of the average microwave oven couldn’t be simpler; all that it contains is a high voltage transformer, a simple diode and capacitor for the power supply, and a Magnetron tube. Any other complexity in the oven — keypads, displays, microprocessors, etc. — are there just to turn the Magnetron on and off at the right times. The beauty of the Magnetron tube is that it’s able to serve as both oscillator and power amplifier and no other parts are required in this application. It’s hard to imagine how this design could be improved by replacing this tube with solid-state devices. The big brothers to the microwave oven in your kitchen are the industrial RF heating units. Industrial microwave systems are used for drying everything from textiles to lumber, for curing adhesives and melting plastics, for food cooking, pasteurization and sterilization, and even welding. Most of us are already familiar with the “glass audio” crowd — audiophiles who prefer the sound of vacuum tube amplifiers — but there’s a flip side to this coin. All modern manufacturers of guitar amplifiers still feature vacuum tube amplifiers as a major part of their product line, and many of them are using designs that haven’t changed substantially for decades. Vacuum tube amplifiers exhibit a “soft clipping” when driven into overload, and this gives a form of distortion that’s deficient in the harsh sounding odd order harmonics produced by solid-state amplifiers. Guitar players since the 1950s have intentionally over driven their amplifiers just to get this sound, and there are many classic vacuum tube amplifiers that are prized for the particular sound that they give. Photo 2 shows the chassis of a brand new Peavy Penta guitar amplifier — notice that it’s all tubes! PHOTO 2. The Peavey Penta Guitar Amplifier. While we’re on the topic, vacuum fluorescent displays, or VFDs — those blue green numeric, alphanumeric, and graphic displays often found in appliances and automobiles — are also vacuum tubes. VFDs have a heated filament, a plate (the glowing segments) and, even in the case of multiplexed displays, a control grid. The Thyratron is a gas filled tube with a plate, cathode, and control grid that’s used in on-off switching applications in much the same way that you’d use a silicon controlled rectifier. However, unlike SCRs, there are Thyratron tubes that are able to switch short pulses in the hundred megawatt (!!) range. Such tubes are used today to control pulsed radar transmitters and X-ray machines. Another interesting feature of Thyratrons is that they can have a rise time — the time it takes the device to switch from off to on — that’s on the order of a hundred times faster than an SCR. That fast switching time alone is enough to justify the use of a Thyratron in applications such as “crowbar” circuits for high voltage power supplies or firing circuits for pulsed lasers, even where solid-state devices could otherwise handle the power levels involved. Two specialized Thyratrons — the Krytron and Sprytron — are able to switch in subnanosecond intervals. This sounds like an esoteric concern, but, in fact, it makes them ideal for triggering explosives, particularly in situations where multiple charges need to be detonated with precise timing. This is exactly the situation you’d find yourself faced with if you were building an atom bomb, and Krytrons were used in the detonator for the original Fat Man bomb. Obviously, I don’t know whether they’re still used for this purpose today, but the sale and export of Krytrons and Sprytrons are tightly regulated by the US Government. And, although they aren’t really vacuum tubes in the sense that we’re talking about here, it’s worth pointing out that the ubiquitous fluorescent lamps, mercury vapor lamps, and low pressure sodium street lamps are all gas discharge tubes. Neon signs, Xenon flash lamps, and even gas lasers all also belong to this category. One of the oldest forms of vacuum tube — the X-ray tube — has been around since the late 19th century. Besides the obvious application of medical imaging, X-ray tubes are used today for security scanners (we’ve all seen those at the airport), food inspection systems, thickness gauges, and more. PHOTO 3. S11 X-Ray Tube. Photo courtesy of Source 1 X-Ray. Vacuum tubes are also still useful as detectors for x-rays and other ionizing radiation. The most obvious case is the Geiger Müller tube which is at the heart of a Geiger counter, but scintillation detectors also use photo multiplier tubes to detect the tiny flashes of light that occur when radiation strikes a radio luminescent crystal. One of the most interesting applications I came across while researching this article are the so-called “down hole” instruments used in the oil industry. Not surprisingly, it’s really, really hot at the bottom of an oil well — temperatures at the bottom of a several miles deep borehole can reach over 400°F — and, until very recently, solid-state devices were unable to survive in this environment. 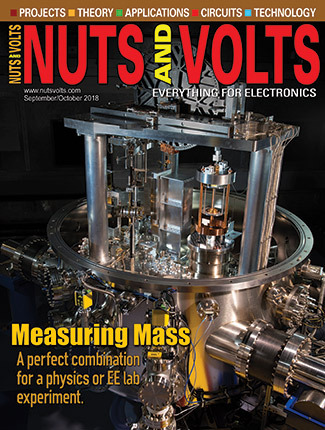 But on the other hand, Nuvistors — a miniature, all metal vacuum tube invented in the 1950s for UHF applications — can operate up to 500°F or more. 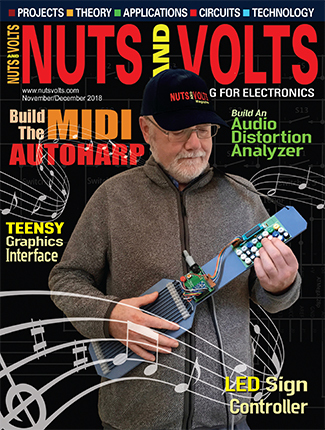 Nuvistors were used in down hole instruments up into the 1990s and have only been supplanted by solid-state devices in the last decade. I wanted to end by saying that vacuum tubes would be with us forever, but it’s not that simple. Many of the applications I’ve mentioned are slowly but surely being overtaken by solid-state devices. LCDs are steadily replacing CRTs, and it won’t be that long before CRTs disappear. There are already several, completely solid-state MW/SW broadcast transmitters in the hundred kilowatt range, and there are a number of solid-state alternatives to TWT transmitters for satellite links. The latter are generally much lower power than their TWT ancestors — transistors are still not good for high power levels at microwave frequencies — but for satellite Earth stations, the gain of a 10 meter dish obviates the need for lots of power. Even the guitar players may switch eventually — Peavey engineers have studied gain, response, compression, and several other factors that create the “tube sound” and have come up with a line of “TransTube” all solid-state amplifiers. Eimac Division of Communications & Power Industries (CPI), www.Eimac.com. Source 1 X-ray Tubes, www.source1xray.com/xraytubes.htm. “CRT Still Rules TV Market,” Electronic News, 6/5/2006. “CRT Not Ready for the Museum Shelf,” Electronic News, 5/25/2005. “Design of a 250MW Hydrogen Thyratron,” IEEE Pulsed Power Conference, 1993. “The Great Krytron Caper,” The Washington Report, July 15, 1985. Nautel solid-state broadcast transmitters, www.nautel.com. 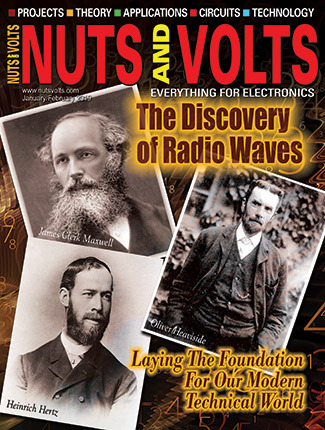 A collection of stories devoted to the life and times of our old friend, the vacuum tube and the birth of radio. 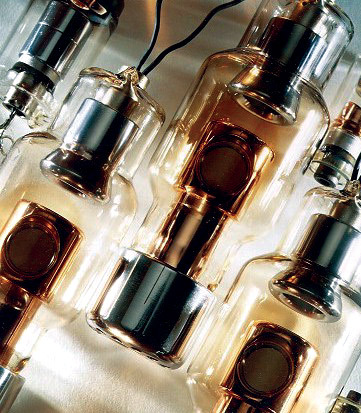 This year (2006) marks the 100th anniversary of Lee de Forest's Audion or first vacuum tube triode. This vast improvement upon John Ambrose Fleming's valve changed the world like few other events since. The engineering challenges of the hot cathode vacuum tube — an invention dated 1906 — are the same today as they were then. 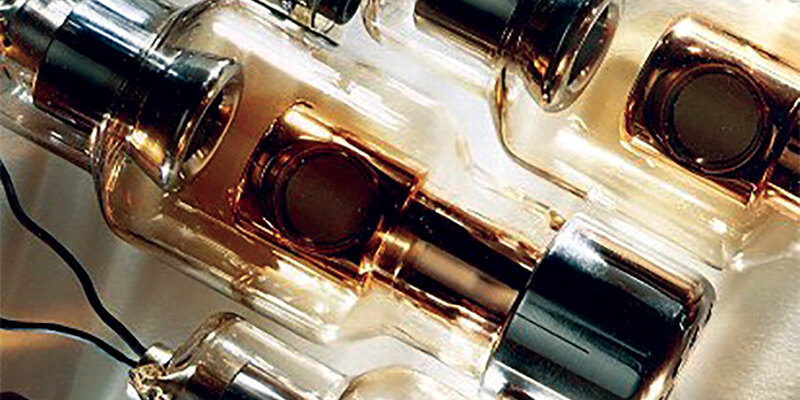 The inventing of new, more compact and efficient vacuum-tube designs proliferated madly up until the 1950s, but the art has been frozen ever since. Hard as it may be to believe, there are still some applications today where a vacuum tube is a better choice than a transistor, and even a few applications where transistors simply aren’t an option and a tube is the only choice available. Sarnoff would take radio out of the exclusive province of the transportation industry and embryonic ham radio hobbyists, and put it into every American home. His stubborn pursuit of technology turned his employer, Radio Corp. of America, into a powerhouse in less than a decade. For anyone interested in electronics, its history, and development, a trip to the Antique Wireless Association Museum is a must. Featured are some of the most unusual and rare exhibits of wireless, telegraph, radio, and television ever assembled.